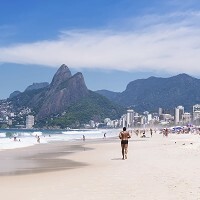 Holidaymakers can enjoy Brazil travel bargains months before the South American country stages the Olympic Games, according to new research. Countries traditionally bump-up tourism prices before they stage a major sporting occasion. But Britons can benefit from the Brazilian real's dramatic fall against sterling ahead of the Olympics in Rio de Janeiro. The country's national currency has plummeted by 39% over the past 12 months, Lloyds Bank Private Banking has found. Tourists heading for Rio's Ipanema Beach can now buy a caipirinha cocktail for £4.50 instead of £6.40 last December. Games-bound Britons should make travel insurance as big a priority as Olympic tickets and hotel bookings in August. Whether they are going to the Games or travelling earlier on in the year, getting appropriate cover can safeguard against taking home ugly memories from a beautiful country. Travel insurance gives peace of mind should the worst happen, including losing your luggage or passport. Brazil is not the only place UK tourists can find a bargain, however. Lloyds finds that British travellers can get more for their money in around 80% of countries because of the UK's improving economy. Of the 61 currencies studied by Lloyds, the UK pound's value has risen against 48. Half of these currencies have seen values fall in excess of 10% over 2015. Holidaymakers heading for the Turkish beaches or catching the English cricket team in South Africa this month can get 24.2% and 23.1% respectively more for their pounds. Zambia's kwacha, Mozambique's metical and Ukraine's hryvnia have suffered the biggest falls in the past year with 61%, 58% and 49% dips respectively. But it is not all good news for British travellers hoping to make their pounds stretch further, especially in two popular Indian Ocean paradises. The Seychellean rupee has increased by 11% against the pound, a proportion unmatched elsewhere on the planet. The rufiyaa currency in the Maldives is also up over the year - by 4%.